"Our thoughts immediately turn to Father Damien de Veuster, who gave his life for these brothers and sisters. To his heavenly protection I entrust all those people who, unfortunately still today, suffer from this disease, and all those health workers and volunteers who give themselves for the sake of a world without leprosy." 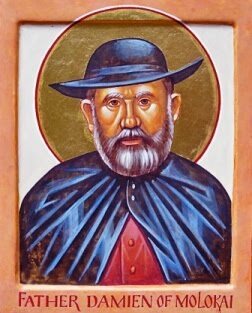 Father Damien (1840-1889) was a Belgian priest who volunteered to minister to the leper colony in Molokai, in Hawaii. He eventually contracted the disease and died a leper. He was canonised in 2009.